This week I am playing along with the Heart2Heart Challenge. The theme for the week is Rainbow. When I think of a rainbow, I think of beauty and simplicity. My card is a CAS card (Clean and Simple). I used Sapphire, Cranberry, Pansy, Tangerine, Willow and Lemon ink. 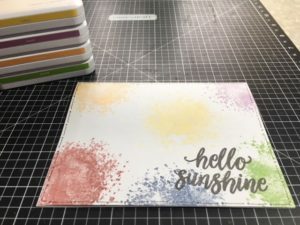 Stamp sets that I used were Splash of Color and Sunny Thoughts which was a SOTM. Hope you are having a great week. Happy Crafting. Like the splash and combination of colors…fun card. Thanks for sharing with us at Heart2Heart. Please join us again. And we will be starting our April challenges soon, and you have all month to create. 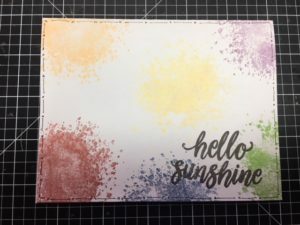 Those splashes of color create a great background for your card. Love the simplicity of it that allows the sentiment to stand out. Fun card, I love the different colour ink splats, adorable! Thanks for playing along with Heart 2 Heart Challenges (H2H).